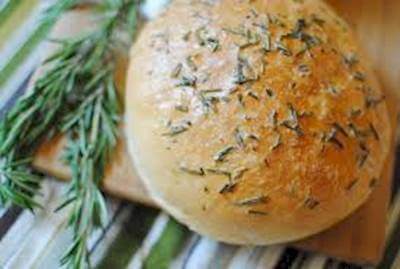 Dried basil add a classy note to homey quick bread! In this hearty bread basic pantry ingredients come together for a magnificent treat to make this new family-favorite bread. RecipeSavants.com Dried basil add a classy note to homey quick bread! In this hearty bread basic pantry ingredients come together for a magnificent treat to make this new family-favorite bread. Smart Recipes, American Recipes, Eggs Recipes, Recipes Eggs American Basil Olive Oil Bread PT40M Serves 6 Ingredients: 1 Tablespoon Yeast 1 Tablespoon Sugar 1 Cup Warm Water 2.5 Cups Bread Flour 1 Teaspoon Salt 2 Tablespoons Dried Basil 2 Tablespoons Olive Oil 1 Egg In a food processor, add sugar, yeast and warm water and keep aside till bubbly. Add remaining ingredients except basil and egg and pulse till smooth and elastic. Transfer dough ball into a greased bowl. With a kitchen towel, cover the bowl and keep aside in warm place for about 1 hour or till doubled in size. Divide dough into 2 equal sized balls and keep aside for at least 5 minutes. Shape each ball into a loaf and coat with egg wash. Sprinkle each loaf with basil evenly. Arrange each loaf onto a baking sheet. Keep aside for about 45 minutes or till doubled in size. Preheat oven to 375 degrees. Bake for about 15-20 minutes.